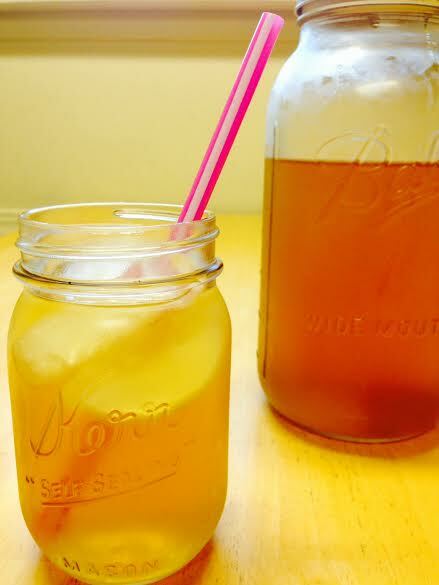 I love making a variety of fermented foods and beverages, especially water kefir. I often give away water kefir grains to people and they ask me about how they should make their water kefir, so I figured that rather than explain the process to lots of people many times, I’d just write it all down here and direct people to my blog! I’m all about efficiency. And if you, dear reader, are lucky enough to have received some water kefir grains from one of your friends, or if you are just generally interested in learning how to make water kefir, read on! Water kefir is a fizzy probiotic drink. Fermented foods and beverages are the way that all kinds of traditional societies got those good bacteria into their tummies for centuries before the invention of probiotic pills. And personally, I think it’s a superior way to take in probiotic bacteria, since it’s in a form our bodies recognize: REAL FOOD! If you are familiar with kombucha, it’s similar to that, although kombucha is fermented sweet tea and this is fermented sweet water. It has a sweet, molasses-ey kind of taste, but with a tart, acidic kick. One of my friends said, “It tastes like a sweet beer!” and I think she’s right. The yeast that ferments the water kefir gives it a flavor a little similar to beer. But don’t worry – it’s non-alcoholic! (Not that you couldn’t MAKE it alcoholic. Just between you and me, one of my favorite mixed drinks is water kefir and vodka. I’m sure the vodka kills any beneficial probiotic bacteria swimming in the kefir, but man, is it tasty!) Water kefir is fermented with water kefir ‘grains’, which are not actually grains but rather lots of little gelatinous translucent blobs of bacteria and yeast. Sound weird? It totally is, but it’s also totally awesome. My water kefir grains are called The Minions. I never had pets as a child, so all my fermenting critters are my ‘pets’ and I name them and regularly assign them anthropomorphic characteristics. The bacteria and yeast munch, munch, munch away on the sugar and produce vinegar, giving the water kefir its distinctive tang. Again, it’s similar to kombucha, but kombucha is fermented with a SCOBY, a ‘symbiotic colony of bacteria and yeast’, which is also bacteria and yeast but in one big ‘mushroom’, AKA a big freaky brain-looking blob thing. See? Food and science. Maybe mad science. ISN’T IT COOL? I love this stuff. Bring a little more than 1 quart of water to a boil (some will evaporate). Stir in the sucanat sugar (or ¼ cup white sugar + 1 teaspoon molasses) and stir to dissolve. Let the sugar water come to room temperature, or at least not screaming hot. You don’t want to kill your water kefir grains. Pour the sugar water into the jar and add the ¼ cup of grains. Cover the jar with cheesecloth and secure it with a rubber band. Set it on a countertop for 24 to 48 hours. When the water kefir is fermented, strain out the grains and use them to start a new batch. You can then bottle the liquid and put it in the fridge to chill. It’s super delicious chilled and very refreshing served over ice! Kefir grains will multiply over time. I often give them away to friends, but if I don’t have anyone to give them to I’ll toss the extra grains on the garden to give the plants some extra nutrients. Here’s a list of things you can do with extra water kefir grains. The golden ratio for water kefir is 1 quart of water to ¼ cup sucanat sugar to ¼ cup kefir grains. You can scale this up or down depending on how much you want to make. Just keep in mind that water kefir requires a little more babysitting than other fermented foods; it’s a new batch every couple of days, so make the right amount for what you can manage to drink. As with kombucha, the longer you let it ferment, the more sugar the grains will eat so it will become less sweet and more acidic. I often let it go more like 5-7 days because I want it less sweet and more tart, though I’ve heard people say this can ‘starve’ the grains of sugar and weaken them over time. My grains don’t seem to be weakening, but it’s something to keep in mind if you decide to let it ferment longer too. I’ve also heard it said that you shouldn’t let the grains come in contact with metal as it also weakens the grains. I usually use a silicone strainer, but I’ve also used a metal strainer and my grains don’t seem to be weakening or dying. But who knows. Maybe I’m a bad water kefir mommy. You can flavor water kefir with juice and/or fruit, and the sky’s the limit when it comes to combinations. Pinterest can give you all kinds of ideas for different flavorings. I haven’t tinkered too much with different flavors — I prefer my kefir plain because I enjoy the flavor of it naturally — but you can find lots of recipes for flavoring water kefir on Pinterest. If I’m tired of the babysitting and want to take a break from water kefir for a while, I put the grains into a small jar with some sugar water and put them in the fridge. The cool temperature slows down the fermentation and effectively puts them to sleep. Then, when I’m ready to start again, I’ll wake them up by taking them out and starting a fresh batch of water kefir. Again, I’ve heard this isn’t ideal, but so far my grains haven’t seemed to suffer for it. If you’re interested in learning more about fermented foods and drinks, I highly recommend the books Wild Fermentation and The Art of Fermentation by fermentation rockstar Sandor Katz, the book Fermented by Jill Ciciarelli, and the book Nourishing Traditions by Sally Fallon.